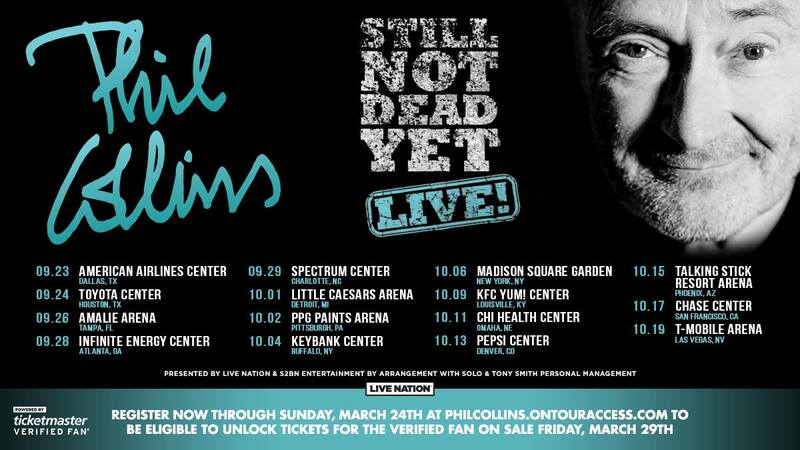 / Phil Collins: More shows in the USA this fall! Phil Collins has finished his Australien / New Zealand leg of his (Still) Not Dead Yet Tour more or less recently (click here to read our report from the Melbourne shows) and will be playing in Europe this summer (mainly outdoor). Today, he has announced another run of shows for North America in September and October. 15 shows have been confirmed and ticket sale starts 29th March. There is an option to gegister for a presale / fansale here. A full list of dates can be taken from the image, further information is available in our Still Not Dead Yet Live tour dates page. Meanwhile, you may also check our setlist page - all shows so far and all setlists on one page.